While I have admired shows like “Bloodline” and “Daredevil,” they were not exactly groundbreaking television in those terms. “Sense8,” premiering this Friday in its entirety for your binge-watching pleasure, is defiantly strange. It is untraditional in nearly every sense, something that will throw even diehard fans of science-fiction programming or the controversial films of the show’s creators, the Wachowskis and J. Michael Straczynski (“Babylon 5”). Much as they did with “Cloud Atlas,” the Wachowskis are exploring identity, gender, sexuality, and much more in a way that defies traditional narrative understanding. To complain that “Sense8” doesn’t make traditional sense is to undervalue how it’s working more emotionally and philosophically. Now, that’s not something that will interest everyone and, again, like the Wachowskis' recent films, some will hate “Sense8.” Me, I’m happy Netflix is giving a platform to something this daringly different, and I can’t wait to see where it goes after the three episodes screened for press. “Sense8” opens with a clearly distraught woman (Daryl Hannah) alone in an abandoned building. 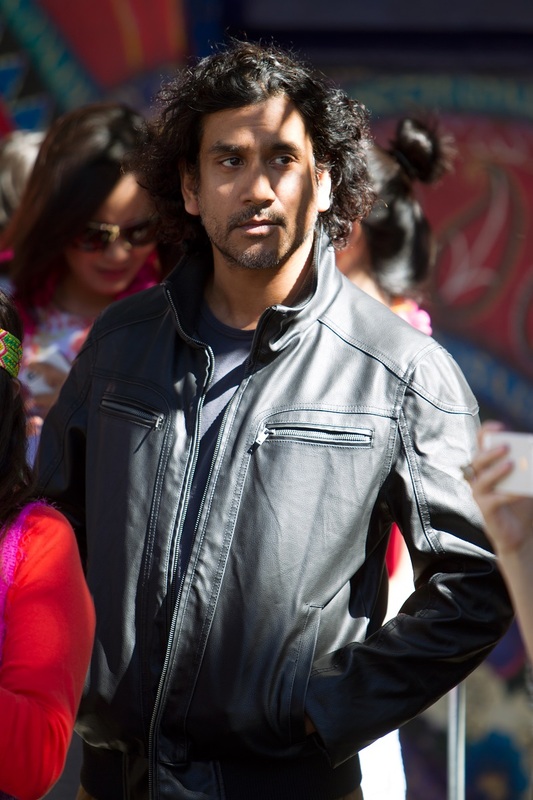 She begins speaking with a man (Naveen Andrews) who seems to appear and disappear into thin air. Then another, who clearly means to do her harm. The second man then enters the room and the woman kills herself, but not before eight people around the world have a vision of the woman. Suddenly, the eight people are inexplicably connected. They all have visions of the same woman and soon her male partner. And they seem intertwined on a sensorial level that defies time and space. One hears loud music next door and busts into the apartment. It’s empty. Cut to the club in which the music is actually playing, attended by another central character. An Indian woman hears rain and thunder and asks for an umbrella before looking out on a sunny day. Cut to the funeral around the world in the pouring rain. Before long, they are communicating with one another and trying to determine why they have been blessed or cursed and what it means for the fate of humanity. Much as Bryan Fuller mentioned in my interview with him this week about “Hannibal,” “Sense8” is working with “emotional logic” more than structural. If you might think that this concept and approach would be difficult to craft into a narrative for a TV series, you’d be right. And yet “Sense8” is never uninteresting. It’s always a bit left of center, a bit unlike anything else on TV. Some will bail before the end of the first episode, but it ends in such a way that two characters realities intersect and sort of create a third one, and you start to realize where this show could be and where this show could go. I was hooked. It helps that the Wachowskis are undeniably strong filmmakers, despite their occasional narrative stumbles. The filmmaking here is fluid and the performances are strong across the board. It’s also notable that this is a program dealing with issues of sexuality and gender in ways rarely seen on TV. And it’s culturally sound. While I wish the non-Stateside material was actually in its native tongue, it’s great to see a show with international cast members and settings that don’t feel like mere set dressing. The piece even pauses for a full-blown Bollywood number in episode two. What is “Sense8”? Three episodes in and I’m not even quite sure. It’s about interconnections and common human need. It’s about how we are more alike, even from a Chicago cop to an Indian bride, than we even think. And it’s not really like anything on television. Even if you consider it a “fascinating misfire,” this is what Netflix needs to do more of: push the boundaries of what we expect from them.